Amanda Do Nascimento is a senior majoring in Commercial Music Business. She is currently Vice President for Hoot/Wisdom Recording, FAU's on-campus record label, and an active member in SAI's music fraternity. She is also interning with the Florida chapter of The Recording Academy, which provides networking opportunities for professional musicians and opportunities for students. Some of these opportunities include access to behind-the-scenes sound checks, access to membership exclusive events and a Mentorship program. In October, Amanda worked with the Florida chapter of the Recording Academy in hosting a District Rally in the Wynwood Yard in Miami to celebrate the passing of the Music Modernization Act.This act, passed by Congress in October, aims to modernize copyright-related issues for music and audio recordings. After graduation, Amanda wants to pursue a career within the music industry as an event planner or find a job helping musicians market their material. Roser Boltes is a sophomore majoring in Art History. This past summer Roser went abroad on her first archeological dig in Sicily, Italy. The FAU study abroad program, Exploring Ancient Sicily at Palike, lead by Professor Brian McConnell, provides students five weeks of hands on experience in an archeological site studying and working under professional archeologists. On her last week at the site, Roser found a coin that was issued by the Greek city of Syracuse. The relatively rare incuse decoration dates the coin to ca. 415 B.C.E., and it shows the active relations between the Greek city and this important sanctuary of the indigenous, Sikel people. Annie Baron is a senior majoring in Political Science. This summer she will be working as a policy fellow at Cavarocchi Ruscio Dennis and Associates in Washington, D.C. Her responsibilities will include summarizing hearings and markups, writing articles on legislative developments, preparing Hill Advocacy Day materials, and providing general support in the firm. 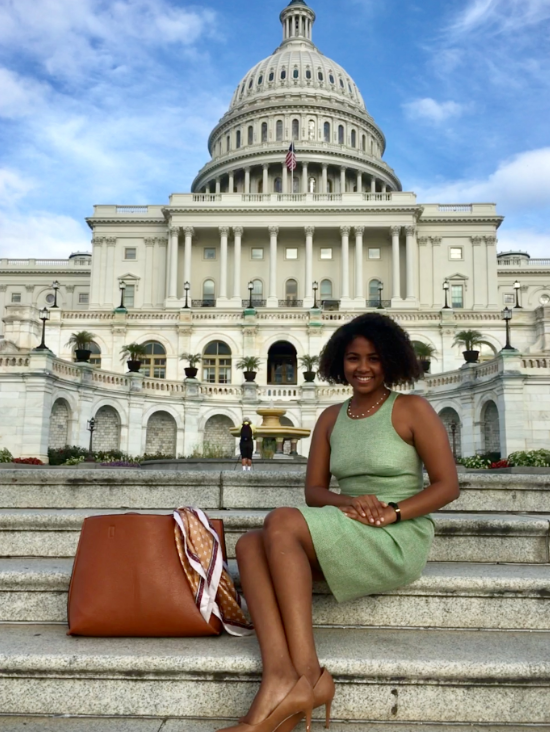 This will be Annie’s second time interning in Washington D.C., as she previously held an internship with a lobbying firm there. On campus, Annie is a part of the Leon Charney Diplomacy Program as well as the Elite Owls, a program designed to recognize exemplary student leaders at FAU. After graduation Annie hopes to be a policy analyst. Sarah Mahoney is a senior, from Wellington, Florida, majoring in Studio Art. She is currently an intern in the Disney College Program at Disney World, where she works in the costuming department in Epcot. Before interning with Disney, Sarah completed an internship at Studio One to One in Wellington. In this role, Sarah assisted in photo editing, as well as marketing and communications for the studio. Sarah's dream job is to be a Disney animator. "The College of Arts and Letters has impacted me so much because it has helped me grow to be more independent, and find myself as an artist. I have realized what I am truly passionate about, which is animation and art. Like Walt Disney always said, if you dream it, you can do it!" Claudia Faust is a senior in Multimedia Broadcast Journalism. She was a sports intern at NBC4 in Washington D.C. this past summer where she had the opportunity to interview players and coaches from the Washington Nationals, Baltimore Orioles, Washington Redskins, and D.C. United. Claudia also previously interned at ESPN West Palm, WPTV Channel 5, FAU Athletics, and she is currently the Sports Director at Owl TV. After graduation this spring, Claudia hopes to work for a professional sports team, preferably a baseball team, as a digital media reporter, or work in public relations for an MLB team. Claudia is originally from Ohio and plans to apply to Arizona State University for a Masters degree in Sports Journalism after a year of work.